United Airlines today made history by becoming the first U.S. airline to publicly commit to reducing its own greenhouse gas emissions by 50 percent by 2050, further strengthening the carrier’s ambition to be the world’s most environmentally conscious airline. United’s pledge to reduce its greenhouse gas emissions by 50 percent relative to 2005 represents the equivalent of removing 4.5 million vehicles from the road each year, or the total number of cars in Los Angeles and New York City combined. The airline will continue to invest in the company’s ongoing environmental initiatives to support this commitment, including expanding the use of more sustainable aviation biofuels, welcoming newer, more fuel-efficient aircraft into its fleet and implementing further operational changes to better conserve fuel. Becoming the first airline to fly with Boeing’s Scimitar winglets, which reduce fuel consumption by an additional 2 percent; United is the largest Scimitar winglet operator today, with nearly 400 aircraft equipped with these winglets. 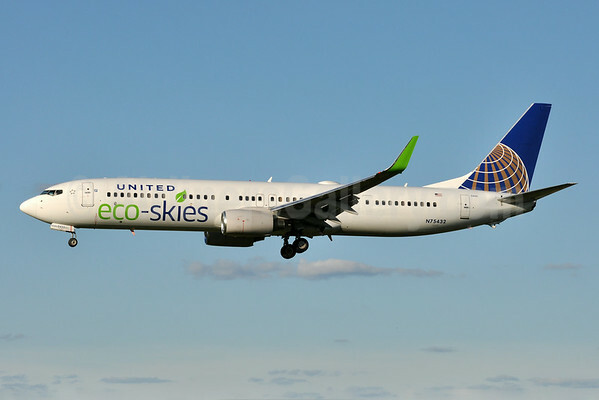 Top Copyright Photo (all others by United): United Airlines Boeing 737-924 ER WL N75432 (msn 32835) (Eco-Skies) IAD (Brian McDonough). Image: 922859. 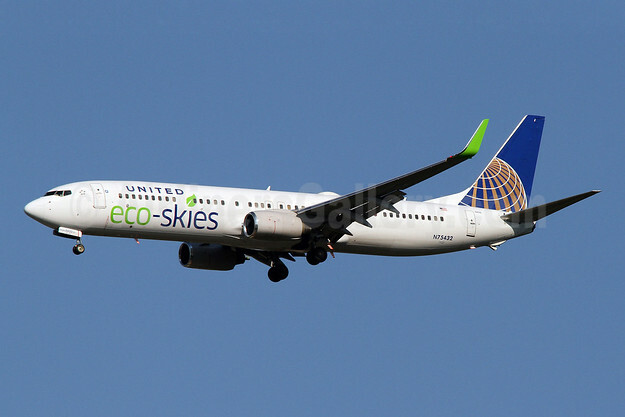 This entry was posted in United Airlines and tagged Boeing 737-924 ER WL, Eco-Skies, msn 32835, N75432, United Airlines on September 13, 2018 by Bruce Drum. 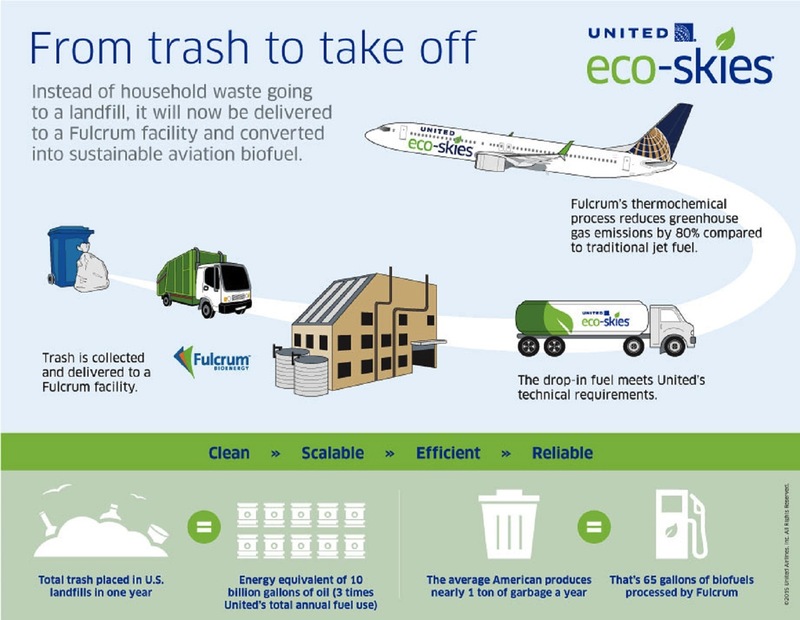 United Airlines (Chicago) today announced an historic $30 million equity investment in U.S.-based alternative fuels developer Fulcrum BioEnergy, Inc., a pioneer in the development and commercialization of converting municipal solid waste into low-cost sustainable aviation biofuel. It is also the single largest investment by a U.S. airline in alternative fuels and sets United apart in the aviation industry in the advancement of aviation biofuels and carbon emissions reductions. In addition to the equity investment, United and Fulcrum have entered into an agreement that contemplates the joint development of up to five projects located near United’s hubs expected to have the potential to produce up to 180 million gallons of fuel per year. United has also negotiated a long-term supply agreement with Fulcrum and, subject to availability, will have the opportunity to purchase at least 90 million gallons of sustainable aviation fuel a year for a minimum of 10 years at a cost that is competitive with conventional jet fuel. This alternative fuel will be a drop-in fuel that meets all of the airline’s technical requirements and specifications, and will power the aircraft in the same way as conventional jet fuel. Fulcrum expects its first alternative fuels plant to begin commercial operation in 2017.
has successfully developed and proven its technology to convert MSW into low-cost, low-carbon transportation fuels in an innovative, clean and efficient thermochemical process. MSW is an attractive biofuel feedstock as it is low cost, has limited volatility and a virtually unlimited supply. United’s agreement with Fulcrum is expected to decrease the airline’s carbon footprint through the use of sustainable aviation biofuel, while also diverting waste from landfills and creating new jobs in those communities where new Fulcrum facilities are sited. Fulcrum’s projects have also received support and participation from the U.S. Air Force and U.S. Navy for the future production of fuel that meets military specifications. In 2013, United announced an agreement with AltAir Fuels for advanced aviation biofuels to be used on flights out of the airline’s Los Angeles hub, making it the first U.S. carrier to execute a commercial scale agreement for aviation biofuels. United expects to begin regularly scheduled flights using AltAir’s fuel later this year. Top Copyright Photo: Tony Storck/AirlinersGallery.com. United’s Boeing 737-924 ER N75432 (msn 32835) is painted in this special Eco-Skies livery (inherited from Continental Airlines). N75432 lands at Baltimore/Washington (BWI). This entry was posted in United Airlines and tagged 32835, 737, 737-900, 737-900ER, 737-924, Baltimore/Washington, Biofuel, Boeing, Boeing 737, Boeing 737-900, Boeing 737-900ER, BWI, Eco-Skies, Fulcrum BioEnergy, N75432, United Airlines on June 30, 2015 by Bruce Drum. United Airlines (Chicago) is renewing its pledge to reduce its environmental impact through its Eco-Skies program. The airline has put into service this month a new Boeing 737-924 ER (N75432, msn 32835) with special “Eco-Skies” markings. In 2013, United Airlines honored Earth Month by announcing its new goal to save 85 million gallons of fuel in 2013, equivalent to 828,750 metric tons of CO2 or roughly $275 million dollars at current fuel prices. Fuel is the airline’s single largest expense and its primary focus environmentally, and the company has several initiatives in place that will allow it to achieve its fuel efficiency goal. United has already improved its fuel efficiency by 32 percent since 1994 through programs such as improved flight planning, single engine taxiing, lighter products onboard, and use of ground power instead of the onboard auxiliary power unit to save fuel and reduce carbon emissions while aircraft are parked. The airline is also investing in a modern, fuel-efficient fleet to replace less fuel-efficient aircraft. In 2012, United ordered 150 brand-new Boeing 737 narrowbody aircraft powered by fuel-efficient CFM engines. In addition to purchasing new aircraft, United is also improving the performance of its current fleet. The airline was the launch customer for the new Split Scimitar winglet, which is an advanced and improved winglet for the 737 Next-Gen aircraft and helps the aircraft consume up to 25 percent less fuel per seat than the 737-500 aircraft the company is retiring. United already has other winglets installed on more than 300 of its aircraft, including its entire Boeing 737 fleet and many of its 757 and 767 aircraft. Winglets reduce drag on the aircraft, ultimately reducing fuel burn and carbon emissions by up to five percent. United’s fuel savings initiatives are part of the company’s larger commitment to environmental sustainability under its Eco-Skies program. United has a genuine commitment to responsible actions that reduce its impact on the environment through its Eco-Skies program. Eco-Skies is designed to make a positive impact on the environment – in the air, on the ground, at United’s facilities, with its business partners and across communities the airline serves. United operated the first U.S. passenger biofuel flight powered with a mixture of renewable algae-derived jet fuel and conventional jet fuel, and signed letters of intent to negotiate the purchase of more than 50 million gallons of sustainable biofuels. United launched the Eco-Grants initiative which provides $50,000 cash grants to 10 local environmental organizations that the airline’s employees volunteer with in their communities, with volunteer projects starting this month and taking place throughout the country. United spearheaded the Midwest Aviation Sustainable Biofuels Initiative (MASBI), in partnership with Boeing, Honeywell’s UOP, the Chicago Department of Aviation and the Clean Energy Trust, to advance commercialization of cost-competitive aviation biofuels. More than 24% percent of United’s ground equipment fleet is electric or alternatively fueled. During the last six years, United recycled more than 20 million pounds of cans, paper and plastic items from waste generated inflight and at its facilities resulting in a net reduction of 28,700 metric tons of carbon emissions – or an equivalent of removing over 5,000 cars from the road over that same time period. Eco-Teams, comprised of cross-divisional representatives, are at every hub and major facility. United’s enhanced carbon offset program allows its customers to calculate and offset the carbon footprint associated with their air travel and cargo shipments. 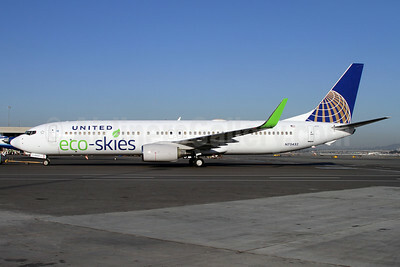 For more information on United’s environmental commitment, visit www.united.com/ecoskies. Copyright Photo: Mark Durbin/AirlinersGallery.com. Boeing 737-924 ER N75432 pushes back from the gate at the San Francisco hub yesterday (January 25) in the new markings. Per seat, the new dash 900 model (replacing older types) is the most fuel-efficient 737 ever built. This entry was posted in United Airlines and tagged 32835, 737, 737-900, 737-924, Boeing, Boeing 737, Boeing 737-900, Eco-Skies, N7532, San Francisco, SFO, United Airlines on January 26, 2014 by Bruce Drum.